Toady the Azamara Quest called on the Port of Cork, which is actually located in the town of Cobh, Ireland. For me visiting Cobh was a sort of coming home. Like so many Irish-Americans, my family can trace roots back to the immigrants who left this seaport town on a ship destined for riches in America. At the entrance of Cobh, known from 1850 until the late 1920s as Queenstown, stands a statue of Annie Morre who (to me) represents the over 2.5 million adults and children who immigrated from Ireland via Cobh on Coffin Ships, early steamers and finally on great ocean liners. The day would be filled of reminders from the past and hints of more heritage encounters to come. The Anne Moore tribute in Cobh, Ireland. The Azamara Quest crossed the English Channel under bumpy conditions. When we came alongside this morning it was under very wet conditions. I brought my rain gear in anticipation of Ireland's legendary rain, so all was well. A small group of us boarded a motor coach for a 45-minute drive into Cork from the port. Our tour guide Eleanor talked the entire way, which was ok and very authentic – the Irish are known for their ability to tell a story. Eleanor was a treasure trove of knowledge and she even sang us a song at the completion of our tour. Upon further study of the Azamara Club Cruises daily newsletter Pursuits, it actually mentioned that passengers would discover citizens of Cork to be the most talkative of all the Irish. "Corkonians have a characteristic sing-song-y cadence you’ll find everywhere," the program stated. And when it came to Eleanor, that was spot-on. The Cork City Panoramic Tour & Irish Coffee Azamara Shore Excursions tour was a good choice for me since I am on the mission to connect with my heritage. I was looking for signs that would help me learn more about my Irish roots, which our family history says stems from County Cork. Eleanor did a good job pointing out sights along the way as we drove down Merchants Quay and St. Patrick's Street. We learned about the history of French Quarter, English Market, and the story behind Father Matthew's statue. After a brief photo stop at St. Finbarr’s Cathedral we went to Cork University College for a stroll. The rain had stopped and it was lovely to venture off for a bit on my own to check out the school’s buildings. Of special interest to me was the connection between George Boole and the college. For those that are not familiar, George Boole was appointed as the first Professor of Mathematics at University College Cork in 1849. He was an English mathematician, philosopher and logician. His work in the fields of differential equations and algebraic logic helped shape today’s computer programming that is based upon Boolean algebra. After our walk and motor coach of Cork’s highlights we went to the Montenotte hotel for an Irish Coffee. Most everyone welcomed the local drink specialty and enjoyed the cocktail consisting of hot coffee, Irish whiskey, and sugar, stirred, and topped with thick cream. As Eleanor said, “Irish coffee warms the cockles of your heart.” – she was right again. The Azamara Quest was centrally located to the city center of Cobh, which made it easy to spend time in town after the tour. Opting to not eat on the ship for lunch, I headed to a pub for a pint and some fish and chips. This would be my first sampling of bar services in Ireland, which would be a right of passage for me given my heritage. Once my gastronomic needs were met, I went shopping for souvenirs to remind me of my perfect day in port. I found a coat of arms with my Father’s maternal family name and headed back to the ship. After learning about the surrounding area of Cork and Cobh and eating and drinking the local food, all that was left for my total immersion program was some Irish dancing. Later in the day, Azamara Quest brought onboard a local Irish folkloric group who would perform for guests. For half an hour students from the Attridge Academy from Cork entertained guests with a lively show featuring tradition Irish dancing and songs. The performance was very entertaining and even Captain Jose Vilarinho could not contain his excitement after the show. Azamara's Captain Jose enjoying an onboard performance. 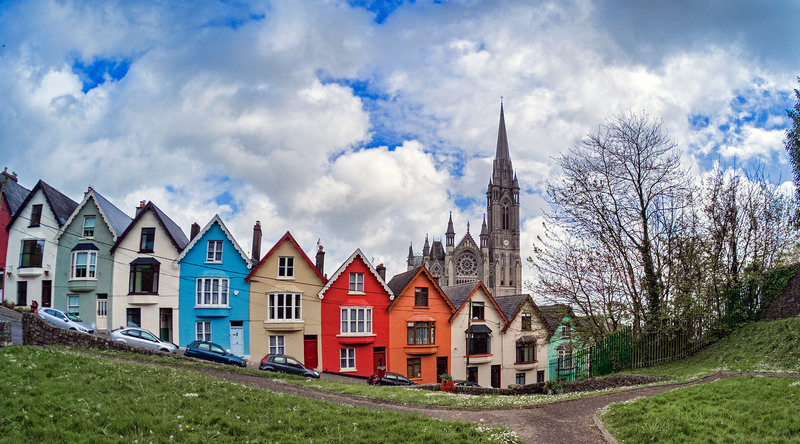 Azamara Club Cruises has three voyages calling on Cork (Cobh), Ireland in 2016 and 2017. View them here.